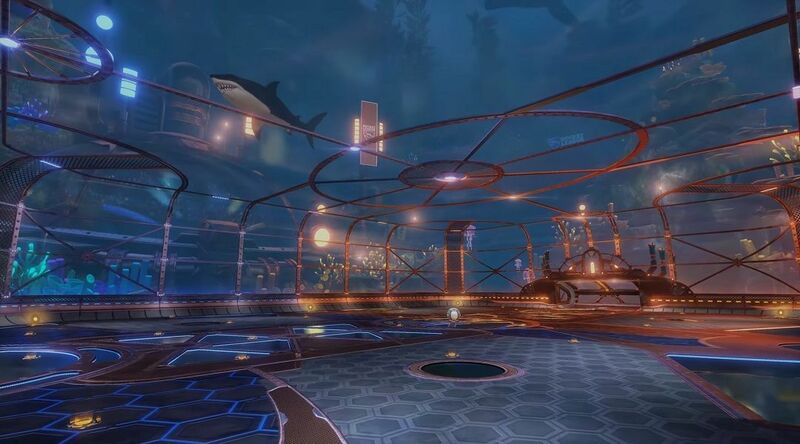 Psyonix has decided to release a BioShock-esque trailer for Rocker League which reveals a new aquatic arena, the Aquadrome, that will get its way into the game for free in October. Although it's been more than a year since Rocket League was first released, the popularity of this car-soccer game grows larger. This is mostly due to Psyonix releasing free and paid updates for the game on a regular basis, meaning fans have new content to bite upon, whether it's new cosmetic items or arenas to master. As expected, the next update for Rocket League is just around the corner, set to launch sometime next month. Rocket League's October update, introduced in a flashy trailer that draws parallels to BioShock, will bring along a new arena for all players to enjoy, and free of charge. The arena known as Aquadome, is entirely underwater, with sea creatures such as jellyfish and sharks swimming outside its walls. Structurally, it's the same as all the other Rocket League arenas, but from a visual standpoint, it's one of the most stunning maps Psyonix released up to date. Players get to look forward to more things than the Aquadrome in Rocket League's October update. Psyonix is adding a few new cars alongside the new arena, costing 1.99$ each. The first car is a sleek submarine-shaped Triton, and the second one is Proteus, which looks like a marine biology research vessel. These new vehicles will join the game's previously released cars, including the Batmobile and Back to the Future's DeLorean. October's update will mark the first major content update for Rocket League fans have seen in a few months, but that doesn't mean that Psyonix is slowing down or quitting support for the game. The truth is quite the contraire as Psyonix has big plans for Rocket League's future updates, and if everything goes to plan, one of those updates could make Rocket League the first PS4/Xbox One cross play game. No matter if it's new game modes or free arenas, no one is sure what Psyonix has planned for the future of Rocket League beyond the Aquadrome update. Assuming Rocket League is able to maintain the popularity it has and continue ranking in millions of dollars, Psyonix will support it for years and years to come.